Bob Pierce: This One Thing I Do Here is a larger-than-life portrait of a man who began with compassion for one child in China and ended up with a program to rescue countless thousands around the world. 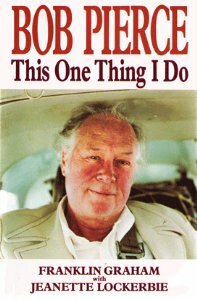 Bob Pierce: This One Thing I Do is the story of Robert Willard Pierce, outstanding evangelical humanitarian—founder of World Vision and Samaritan’s Purse, co-founder of Youth for Christ—a man whose constant prayer was that his heart be broken by the things that break the heart of God. Limit one per household. Book shown is hardback, but shipped copy will be paperback.